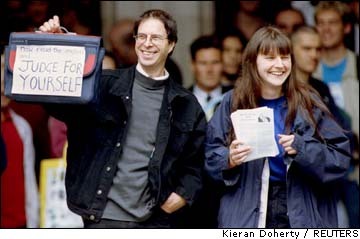 On 19th June 1997 Mr Justice Bell took two hours to read his summary to a packed court room. In his view, Helen and Dave had not proved the allegations against McDonald's on rainforest destruction, packaging, food poisoning, starvation in the Third World, heart disease & cancer and bad working conditions. But the Defendants had shown that McDonald's "exploit children" with their advertising, falsely advertise their food as nutritious, risk the health of their long-term regular customers, are "culpably responsible" for cruelty to animals reared for their products, are "strongly antipathetic" to unions and pay their workers low wages. NB. 'Not proved' does not mean that the allegations against McDonald's are not true, just that in the Judge's opinion Helen and Dave did not bring sufficent evidence to prove that they are justified. This was mostly based on the judge agreeing with McDonald's interpretations of the exact meaning of the phrases in the leaflet. The Judge ruled that Helen and Dave had libelled McDonald's, but as they had proved many of the allegations, the company would only be awarded half of the claimed damages: £60,000. Helen eloquently summarised their response, "McDonald's don't deserve a penny, and in any event we haven't got any money." McDonald's later dropped their claim for costs as well as their intention of getting an injunction (a court order preventing Helen & Dave from distributing anti-McDonald's literature) and have said that they do not intend to pursue the defendants for damages. Although this was a sensible move, PR-wise (as the defendants had already stated that they would defy any injunction, meaning they could be jailed) it signalled a clear admission of defeat. The securing of damages and an injunction were the corporation's two aims in starting proceedings (as detailed in their statement of claim). They are now claiming that they are only interested in establishing the truth (for example, that they exploit children). Analysis by Albert Beale of London Greenpeace.